The role of Arab Christians in the Middle East is more important today than ever before, the Palestinian bishop who leads the 70-million strong Lutheran World Federation has told a Danish church gathering. "I believe that Arab and the Middle East Christians maintain a crucial balance in our society. They are the bridge builders, brokers of justice, defenders of human rights and gender equality, and most importantly, they are peacemakers," LWF president, Bishop Munib A. Younan, said. Lutheran World Information reported Wednesday that Younan made his speech May 9 in the northern Danish city of Aalborg. Younan who leads the Evangelical Lutheran Church in Jordan and the Holy Land said, "One of the great challenges of the 21st century will be to reclaim the power of faith as a driving force for justice, peace, and love. 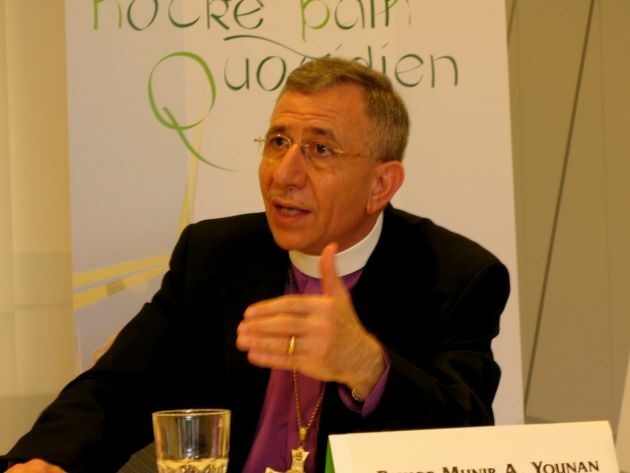 "We must be convinced that no one religion has a monopoly on hate or extremism, and that all of us - Christians, Muslims, Jews - are equally responsible and equally called to work together to seek the common, positive values of love, compassion, justice, and peace," said Younan. The Palestinian bishop who studied theology in Finland was speaking at the Evangelical Lutheran Church in Denmark's Danish Church Days which is the biggest interdenominational event in the country and held every three years. He cited the Council for Religious Institutions in the Holy Land as "a modern day miracle" that makes a difference. In the council Christian, Jewish and Muslim leaders work together in the Holy Land to promote interreligious understanding and cooperation. In recent months the group has been analyzing how Palestinian and Israeli school textbooks depict "the other," due to having two conflicting narratives lacking the values of coexistence. Younan noted that the respective textbooks "treated access to the holy city of Jerusalem as a right exclusive to themselves. "How can we hope for our children to live in peace if we do not plant seeds of hope in them when they are young? Our aim is to make the textbooks more inclusive, so that children will grow up with a knowledge and respect of their neighbor's faith and practice," said Younan. The bishop was asked how from the floor how the church in Denmark can best support Christians in the Arab world. "You can help us by not being for Israel or for Palestine but by being for peace, justice and truth. "You are not to help us against the others; help us only to continue to be Christians in our own society. At the moment, with the Middle East boiling over and in crisis, it's important for us to experience the support of Western Christians," Younan said.